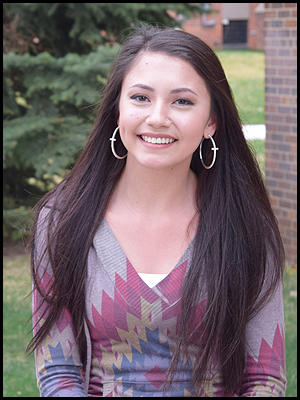 D'Aryn's Indian name is "Wicahpi Wiyakpa", which means "bright star." My name is D'Aryn. My Indian name is Wicahpi Wiyakpa, which means "bright star." I am a member of the Cheyenne River Sioux Tribe. I am the proud daughter of Lewis and Trina. I have two older brothers, Dysan and William, and two little sisters, Daci and Demi. My family is well known in my community. My great grandfather built many buildings in my town and my grandmother owned a bowling alley. I was born and raised in South Dakota and have never moved or transferred schools. I have been granted many amazing opportunities to travel the country through different programs because of my community, and I am very thankful for that. Throughout my life, academics have been a main priority of mine. I have been ranked number one in my class all four years of high school. I see myself as a role model for other students because of how hard I work in school. I have been in many Honors classes. I take the time to study at home and at school when I have down time. I also exceed in Lakota. When I was a seventh grader, I was the MVP in the Lakota language Bowl at Lakota Nation Invitation. I was honored to get that award because I was the youngest one in the competition. Since I was little, I knew I was going to go far in life. I remember my father telling me, when I was a little girl that could still sit on his lap, that when I grew up I was supposed to get him a Rolex with my first paycheck. I have carried that memory with me through all of my successes, and will continue to until that Rolex is on his wrist. That memory shows me that my family has believed in me throughout my whole life. They are my main support group and the ones that push me to my fullest potential. I come from a family of veterans and I would be the first person to go to college, next to Oysan. I know that when I get there, that I will be just fine because I am not the type of person to give up. "I have always loved to help people, so I have decided to go into the medical field." I have always loved to help people, so I have decided to go into the medical field. I am going to become a Pharmacist. 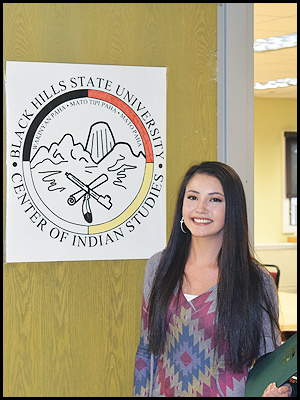 I am going to attend Black Hills State University for two years and transfer to South Dakota State University for my final years to pursue my doctorate degree in Pharmacy. My Indian heritage has always been a huge part of my life. It is so much fun to tell people about my culture and history when they ask about my last name. I am extremely proud of where I come from. I used to jingle dress dance when I was a little girl. My grandmother made my dress and I would help her make the jingles. When she died I stopped dancing because it was not the same without her. She passed away from diabetes, my great grandmother passed from cancer, my grandfather was diagnosed with cancer, and my father was diagnosed with diabetes. These events have influenced my career path greatly. If I were to come back and work in my community, I would work at IHS. That way I could help my people. "I believe I have what it takes to succeed in life." My family has always tried to give us kids everything we want, but sometimes it does not work out the way they plan. My family does not have money to give away. Our financial issues have taught us to not waste, to be grateful, and that needs come first. I plan to pay for college through scholarships and financial aid. I do not want my family to have to worry about paying for my schooling. When I become successful, I want to give back to my parents. They have given me everything I want and more, so I want to do the same for them. I do not want them to have to worry about money anymore. I have learned what it is like to be on my own and away from my family. I have become a more independent person and more outgoing. I have experienced everything a student would experience as a freshman in college. I had to wake myself up, wash my own clothes, experienced homesickness, found my way around campuses on my own, and made new friends. I believe I have what it takes to succeed in life. I would be very thankful to receive this scholarship. It would be put to great use as I go through my journey to pursue my doctorate degree in Pharmacy.